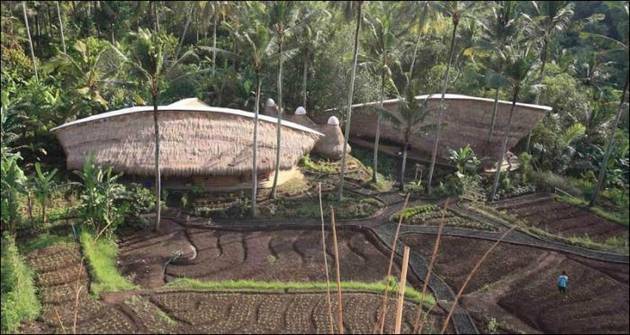 The Green School in Bali is a particularly astonishing place for many reasons. Attendees of the Green School not only enjoy a higher-quality education than what’s normally available in their region, they do so in environmentally friendly surroundings. The school’s 75 buildings are cooled and powered with renewable energy sources like micro-hydro power, solar power, and bio-diesel. Bamboo, lalang-alang grass, and traditional mud walls form the structure of the buildings. The school was carefully built on 20 acres of land and is on an organic permaculture system, designed to work in perfect cohesion with the natural ecology of the land. A thriving organic garden to be cultivated by the school’s own students will grow fruits and vegetables, herbs, and other crops including chocolate. Founders Cynthia and John Hardy opened the school with the goal of having minimal impact on the land and with the stunning Ayung River as its backdrop, it’s a good thing. As often seems the case with this enthralling utopia, Cynthia and John Hardy landed in Bali over thirty years ago and never left. Cynthia, an American, was on an around the world trip before she planned to head to law school at Berkeley and John, a Canadian artist had made his way to Bali for artistic inspiration. Nearly four decades later the couple has opened the Green School, an International School for students from pre-kindergarten through eighth grade that embraces sustainable practices in education and entrepreneurship.